Not sure if this is insult or flattery. 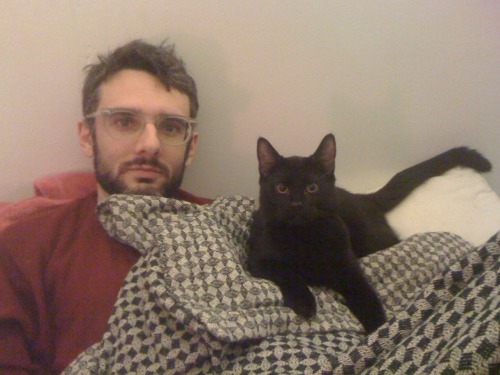 From Cute Boys With Cats; photo by Pink Eye. The evolution of a pet name. Small black cat introduced to main pride. Floppy (a fawnish, foppish, not quite grown into his paws) appearance noted. The name Floppy is coined. As other aspects of his personality become apparent, a ferocious energy, the ability to hold his own in a pride of three other cats, despite his sweet exterior manner invokes comparisons to the reptilian ‘V.’ Floppy becomes Flop-V. An extra “p” is later added for propriety’s sake. Published on April 13, 2010 07:55.